Community Based Health Insurance (CBHI) is meant to help Rwandan citizens get access quality healthcare services. However, access to this insurance is a chal-lenge for marginalized and Indigenous communities. 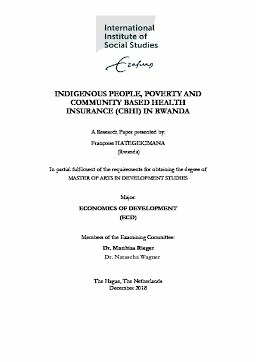 In order to understand these challenges and provide relevant recommendations, the current research addressed the topic of Indigenous people, poverty and CBHI in Rwanda, spe-cifically in the districts of Gicumbi and Huye. There are three main objectives that were to be fulfilled in this study including1) to evaluate the extent that the Indigenous people (Batwa) in Rwanda have access to Community Based Health Insurance (CBHI), 2) to investigate the constraints/barriers for Batwa to access CBHI? and 3) to examine the relationship between enrollment in CBHI and health/economic status of Batwa. In fulfilling the first research objective of the current study, the findings indicate that the Batwa community has low access to CBHI. While 100% of non-Batwa responded that they had enrolled for CBHI, only 70% of the Batwa respondents agreed to the enrolment. In accomplishing the second research objective, the barriers to access to CBHI led to the low- access to CBHI by the Batwa were found to be low household income, high rates of unemployment and low levels of education. Regarding education 77.8%% of Batwa’s with no education had enrolled for CBHI while 22.2% of them had not enrolled for the insurance. On the other hand, only 37.6% of re-spondents with no education were enrolled for CBHI while 61.7% of respond-ents with education had enrolled for the insurance. Concerning employment, Batwas had higher rates of temporary employment (35%) and other informal jobs (38.3%) but low rates of fulltime employment (0%) as well as farming (26.7%) compare to the non-Batwa. When analysing monthly income, the study shows that 68.3% of Batwas belonged to category 1, which is composed of fam-ilies with who cannot afford basic needs. In achieving the third research objec-tive, the study reveals that enrolment in CBHI leads to improved health and economic status for those who enrol into to the program. After enrolment for xi CBHI, 27.1% of Batwa respondents admitted to having good health. Further-more, 71.7% of the Batwa admitted that the CBHI changed their lives in terms of income because out of pocket expenditure on healthcare services reduced considerably. The main conclusion of the study is that the Batwas have low ac-cess to CBHI as a result of low income, lack of education and meagre household income even though CBHI has potential to improve their health and economic status. The recommendations of the study is that the government increase the capacity of the Batwa people for accessing CBHI by providing them with em-ployment opportunities, standardized education and capital for starting profita-ble businesses.